Validating an ERP system helps a company ensure that their processes are consistent and operate in accordance with industry standards. The 21 CFR Part 11 validation process establishes documented evidence that, throughout its lifecycle, the ERP system will consistently function in accordance with its pre-determined specifications and quality attributes. For pharmaceutical and medical device companies, compliance with the FDA requirements outlined in 21 CFR Part 11 and the validation of this compliance, is a critical aspect of the implementation of DEACOM ERP. In this post, we will provide an overview of the validation process. DEACOM’s software development model allows it to act as a “Commercial off the Shelf” (COTS) software, simplifying the 21 CFR Part 11 validation process during implementation. DEACOM ERP software provides many tools to assist with the process which includes recording the history of all data conversion loads completed during implementation, outlining base test scripts that can be configured to support the OQ process, and providing Standard Operating Procedure (SOP) functionality to make creating the documents easier. The FDA requires a specific set of documents as part of the 21 CFR Part 11 validation process and they are listed below. The documents highlighted in blue can be provided by Deacom. The validation plan provides a detailed list of the 21 CFR Part 11 validation activities that is conducted on the system being validated. In general, this document should describe the approach, deliverables, and acceptance criteria for each activity. The table below outlines Deacom’s typical deliverable schedule for each of the primary areas of the validation process. The schedule may be tailored for individual companies as necessary. 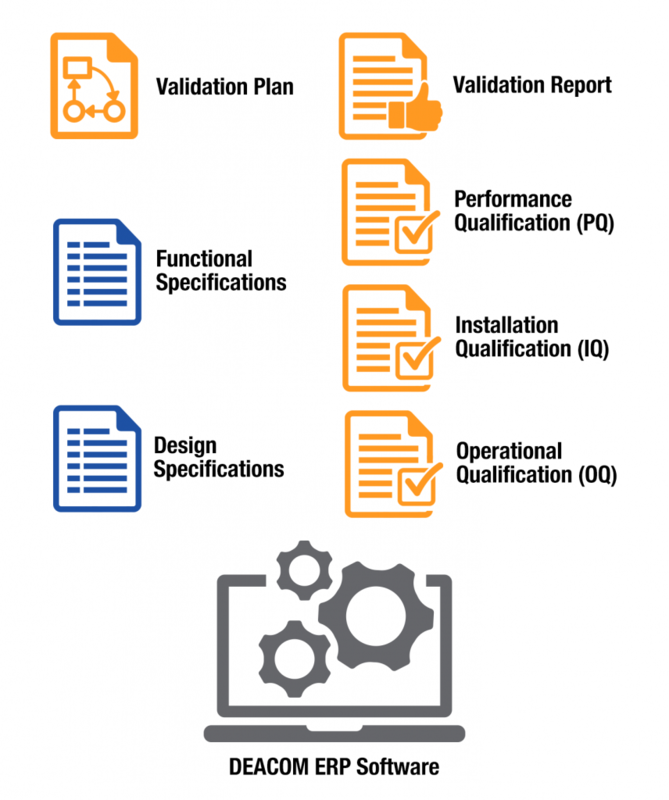 The functional specification identifies DEACOM’s well-detailed requirements, how the system will achieve each of these needs, and the acceptance criteria for a successful implementation. They are typically a blend of the functional descriptions found in the DEACOM help system and the end-user requirements outlined by the company implementing DEACOM. The design specification describes how the software will meet the functional requirements outlined in the prior section. This document is typically a high-level overview of what is required of the software. This phase involves the delivery of the system build that will be in place at the time go-live. With Deacom’s unique development methodology and implementation structure, this phase normally occurs six to eight weeks prior to the projected go-live date. The qualification documents produced during the validation process outline the relationship between cGMP best practices and DEACOM. The installation qualification verifies that all hardware and software related to DEACOM are installed in accordance with the vendor’s installation specifications. The installation qualification document also provides reports on data migrated from a company’s legacy system into DEACOM. The DEACOM software tracks all data migrations and changes through System > View Import History, which produces the necessary reporting for the qualification document. The deliverables for each functional area are the signed-off test scripts with any defects noted. Prior to completing any transactions in the live DEACOM environment, the final signatures must be completed on the validation report. The FDA’s 21 CFR Part 11 guidelines describe the requirements for electronic records and signatures, including the validation of the software used to create and maintain these records. By building upon a strong foundation, Deacom’s streamlined process for validation has proven to greatly impact the ease of validation for our customers in the medical device and pharmaceutical industries. Our ERP software includes the built-in tools necessary to assist you with this process and provide you with the most efficient means of meeting the requirements of 21 CFR Part 11 validation.